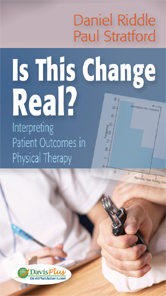 Editor/Author Riddle, Daniel L. and Stratford, Paul W.
This step-by-step guide explains how to incorporate evidence-based methods when interpreting outcomes of physical therapy on individual patients. Chapter 4 How Confident Can I Be About the Outcome Measurement on My Patient? Reliability Coefficients: What Are They? Can I Calculate the SEM If It Has Not Been Reported? Chapter 5 What Does This Outcome Measurement Really Mean? Part 1: To What Extent Does the Measure Assess What It Is Intended to Measure? Part 2: What Is the Interpretation of the Measured Value? Chapter 6 What Does a Change in the Outcome Measurement Indicate? The Concept Behind The Question: What Does a Change in the Outcome Measurement Indicate? Chapter 7 How Can I Establish a Target Goal Value for My Patient? Normal or Customary Values: What Is It? Reference Equations with Multiple Predictor Variables: What Is It? Single-Group Percentile Method: What Is It? Chapter 8 When Should Reassessments Take Place? Modeling Change Over Time: Growth Curves: What Is It? Compilation of Information from Separate Studies: What Is It?